It would be easy at first glance to assume that Crazy Busy is just another book bemoaning the busyness of modern life and handing out helpful tips on how to work less hours, tame your schedule and get through your emails quicker. In many bookstores there is big selection of such books and the blogosphere has even more to say about the topic. Certainly there is some good advice in the book, but this book stands out for going deeper into the underlying spiritual and emotional roots of the problem and how we can work on addressing them. These include things such as feeling kids must be involved in everything possible if they aren’t to fall behind in life, pride about how much we can achieve and neglecting to get enough rest. The book also covered the role of digital distractions in busyness and misplaced priorities was particularly convicting. He finishes his exploration of the issue with a helpful summons back to dedicating time to spend with God, both because it is what we should be doing anyway and because it helps other things in life fall into place a bit better. Towards the end of the book he also makes some useful clarification about the tiredness and schedule demands that can come from following God’s calling and the unhealthy busyness most of the book has dealt with. Although the analysis is at times uncomfortably convicting (in a good way) , it doesn’t descend into feeling preachy as DeYoung shares plenty of his own failings and a bit of humor. Neither does the book drag on even though undoubtedly volumes could be written on the topic. The chapters are fairly short and the whole thing is only 3 hours in audio (128 pages in print). 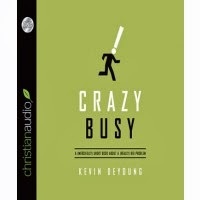 Regardless of whether you think you are crazy busy or just a little bit busy, I recommend you read this book. You’ll likely come out understanding your own behavior more clearly and better equipped to keep your priorities in order.